If you’ve ever jetted across the ocean or taken a cross-country road trip, you know the struggle of what happens when your normal skincare routine gets disrupted! Even if it’s just a short trip to see some family for the holidays, we know that our bodies are sensitive and our skin is the first to show it! When we’re traveling, all we’re thinking about is making the most of every opportunity and going on as many adventures as possible. The last thing we want to worry about is dealing with dry or dull skin or covering break-outs. Plus, with the holidays coming up, we want to make sure we are lookin our best when we’re seeing all the fam and getting asked about our five year goals, who we’re dating, and so on… MY SKIN LOOKS GOOD, JUST LET ME LIVE! There are a few main factors that affect your skin when you’re traveling such as a change in climate, sleep pattern, physical activity, and diet. Let’s be real- when I’m on vacation my diet consists of coffee, pastries, and wine. It’s no wonder our skin takes such a hit, when we’re just trying to live our best lives here! 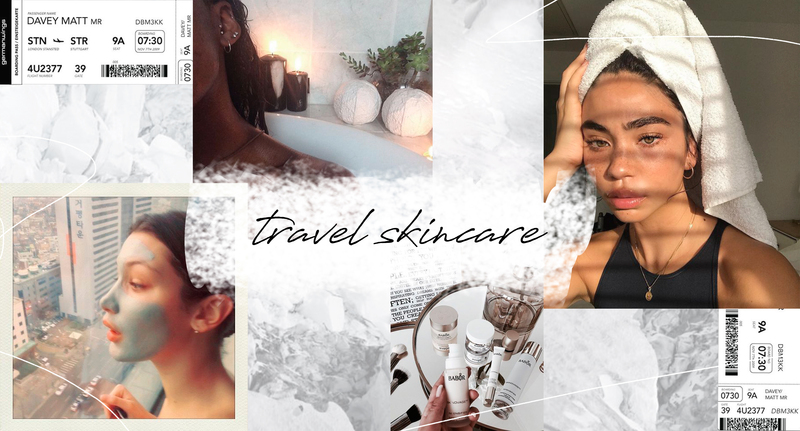 So if you’ve got a traveler’s soul and an adventurous heart, we’ve got your back with a few helpful tips to keep your skin healthy and glowing. Plan Ahead & Adjust – one of our best tips is to just be prepared to adjust! If your trip includes hiking the Grand Canyon, you can leave the oil-based moisturizer at home and bring an exfoliator and toner. Any oils from your skin or dust from the air will build up and clog your pores, so you want to make sure you cleanse thoroughly after an intense day in the Arizona sun. If you’re heading toward a colder climate for a skiing trip, you should adjust your skincare routine to take care of dry skin. I would suggest bringing your favorite moisturizing for daily wear, and an array of deep moisturizing and repairing face masks to use on your nights in. If you’re vacation involves any time in the sun, make sure your moisturizer or makeup has SPF in it to protect your skin. Trust us, save your skin now from the sun and you will definitely thank yourself in a few years! Stick with your Sleep Schedule – we know it’s hard when all you want to do is go out and dance the night away, but don’t completely give up your sleep schedule on your next trip. You may not realize it, but your skin actually repairs itself while you sleep and is essential to having healthy skin. Not to mention, you’ll really enjoy your trip more if you are well rested! If your final destination is in a different time zone, push yourself to adjust quickly so that you’ll get a fairly regular amount of sleep. My personal technique for this is to stay awake the whole first day (no naps!) and then just go to sleep early that night. Stay Hydrated & Healthy– Possibly one of the most important skincare tips for traveling and all the time! If you are well hydrated *with water, not coffee or wine* your skin will look so much healthier! When your skin is naturally hydrated, you won’t have to use as many products just to keep it from getting dry. And, as much as we wish vacation calories didn’t count, keep in mind that your sugar and diary and gluten intake will affect your skin. There is a balance between enjoying that piece of cake and still taking care of your body! Everyone is different, which means that you will find that balance and learn what things work and don’t work for your skin, when you’re traveling and on a daily basis. We hope these tips keep your skin healthy, and the traveling keeps you glowing! To help you with your skincare routine, here are a few of my absolute favorite must have items, all linked! I hope they work for you as well as they have worked for me! Dr.Dennis Gross Skincare: Alpha Beta Extra Strength Daily Peel – FAVE PRODUCT EVER! Keep traveling, enjoying life, and having beautiful and healthy skin! This entry was posted in Beauty, BitterSweet, Blog, Lifestyle and tagged skincare, travel skincare, traveling.